Maps have long been used by people to help navigate and understand our world. Early maps guided early humans to basic necessities such as food and water. Today, the world is changing rapidly, and it’s difficult for traditional maps to keep up with the pace of that change. To help us keep pace with our evolving planet, we need something better. We need new, more comprehensive maps. Esri has developed two new maps—the most detailed population map in the world and the most detailed ecological land unit map in the world—to help address the challenges we face and make our world a better place. Esri has compiled a human geography database of demographics and statistics about all countries in the world and has mapped this data using a new, innovative methodology. Advances in technology are changing the type, quantity, quality, and timeliness of information available. The ideal human geography database would include uniform social and demographic information about all human populations on the globe. It would include population, household, housing unit, business, and economic information that would allow determination of societal characteristics at any scale from macro to micro. Esri’s new world population map takes advantage of this new information to track and estimate populations to support better decision making. This new model of world population will allow comparative studies and accurate depiction of statistics to ad hoc areas. Population is modeled from imagery, road networks, and populated place locations to create an urbanization likelihood score. The U.S. Geological Survey (USGS) and Esri recently announced the publication of the most detailed global ecological land units (ELUs) map in the world. “The Global ELUs map portrays a systematic division and classification of the biosphere using ecological and physiographic land surface features,” notes Roger Sayre, Ph.D., Senior Scientist for Ecosystems, USGS. 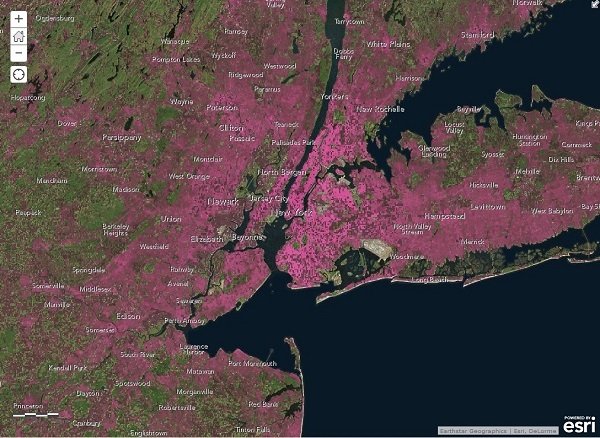 Esri and USGS have developed the most detailed global ecological land units (ELUs) map in the world. This exciting new global content provides a science platform for better understanding and accounting of the world’s resources. Scientists, land managers, conservationists, developers and the public will use this map to improve regional, national and global resource management, planning and decision making. How can you get access to the Global population map? How can you get access to the Global ELUs map?